For those fans who believe in the myth of the Rugby League pyramid, this looked - on paper - like a potentially close encounter. Mayfield, newly promoted to the NCL premier league; Hornets, freshly relegated into RL's League; both teams sitting - ostensiby - one tier apart in the RFL's wonderful new structrure. But the reality of the situation depends, we guess, on your perspective. Indeed, by the time Mayfield wing Rob Kershaw ran off a Matt Calland pass in the 68th minute to score off the home side's first clear break, a ring-rusty Hornets had clocked up a fairly rudimentary 38 points. To be fair, Mayfield began the game with some robust defence. But when Danny Yates dinked a short kick into the corner after 7 minutes for Dale Bloomfield to touch down, to give Hornets a 4-nil lead, it was only a matter of time before more followed. But the home side dug in: the game plodding through a scrappy, shapeless period; the home fans lifted by a brace of Calland drives at Danny Yates (half his size and half his age). Both times Yates standing his ground. On 17 minutes Hornets got over the line, but were pulled back to receive a penalty for being tackled without the ball. Quick hands to the right sent in Brad Hargreaves for a try by the flag. 8-nil. Three minutes later a good Hornets chase off a long kick forced a drop-out and, from the ensuing possession a neat inside ball found Wayne English arriving at pace to score. Crooky now with his eye-in for 14-nill. Then a quick-fire two tries in two minutes to effectively end the game as a contest. 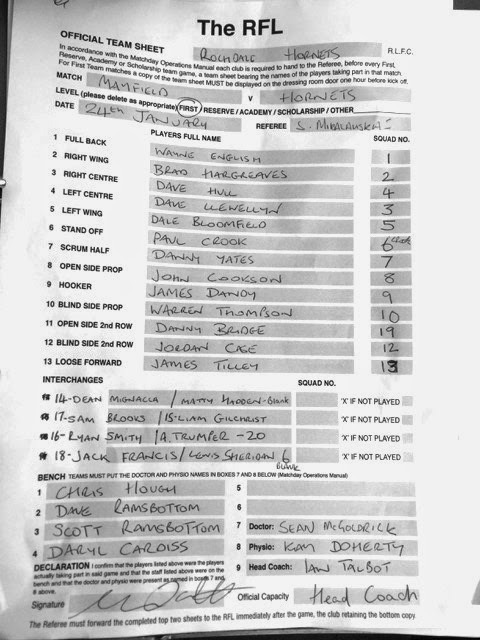 Firstly Dale Boomfield outpacing the defence to score off a beautifully lofted Ryan Smith kick; then some great ticka-tacka passing between Dale Bloomfield and Dean Mignacca up the same left channel created space for Deano to open his Hornets account. Crooky with both conversions and Hornets comfortable at 26 nil. The half ended scrappily, Hornets on the wrong end of a rising tide of facial injuries: Alex Trumper removed with a broken jaw that requires immediate surgery. The second half began with a big centre-field-bust by Dean Mignacca, ended by a crunching high tackle that saw him removed groggily. The nature of rolling substitutions gave the game a bit of a shapeless feel as both sides sought a bit rhythm - and the momentum was gifted to Hornets in the 50th minute when Mayfield's Sam Butterworth was shown a red card for swearing at a touch-judge. Hornets response was immediate; Ryan Smith skating untouched through a retreating defence to score. Crooky the two, 32-nil. On the hour Dave Hull was first to respond to a teasing cross-field kick, gathering to walk past his opposite number. This time Jordan Case with a somewhat unorthodox style to convert: 38- nil. combined to break up a rare attack in the 70th minute, it led to a rush of blood for the home side who blew their hard-won field position with a daft penalty. Hornets went straight downfield where Danny Yates scooted in from 25 metres off a James Tilley break. Jordan case the two - and all done at 44-6. Even as a first hit-out, this was a pretty good effort: though it seemed that the locals had genuinely imagined that the difference between the NCL and the lower reaches of the semi-pro game was much smaller. Here at TLCRF80mins, we know that pre-season games serve a specific purpose of trying combinations, getting players up to speed and identifying areas for fine tuning. Indeed, some might suggest that the results are incidental. A Mayfield supporter said to a Hornets fan next to me on the way out: "It must be nice to win one…". And yeah, he's right - always nice to win, whatever the circumstances. Here's to plenty more in 2015.